We continued the left tradition of producing daily bulletins at NUS Conference, 9-11 April in Glasgow, to report on the campus activism the NUS ignores, react to the day's events and organise people around left-wing ideas and for a democratic, campaigning NUS. Read all three days here! By Christie Neary, NUS Trans Students' Committee 2018-2019 (pc) The NUS finds itself in crisis. 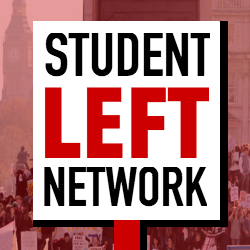 The Trans Students’ and International Students’ campaigns have been scrapped and the NUS UK Board have put together a programme of reforms in alliance with student union CEOs which block all remaining opportunities for ordinary students to exert control or … Continue reading NUS ‘left’ in leadership: fight the reforms!